I had a dream (in 2006, but before December). I was with Meher Baba. He was standing behind a relatively large display case, made of glass, like what you would use to display jewelry or antique collectables, or something. He could reach into it from behind the case, where he stood. I could also reach into it from my side, in front. The top and sides were glass. Inside the case were nothing but photos of Baba. Baba looked surprised, and then got a mischievous look, and instead of reaching into the case, he bent down low, and came up from behind the case with a beautiful blue glass windchime, and handed it over the top of the case to me as a gift. He was so pleased with his surprise gift, and I was stunned and so happy. I woke up. Lilly heard this dream from me, and for Christmas found a beautiful blue windchime and gave it to me as a gift. Now I have one. I am still processing this. 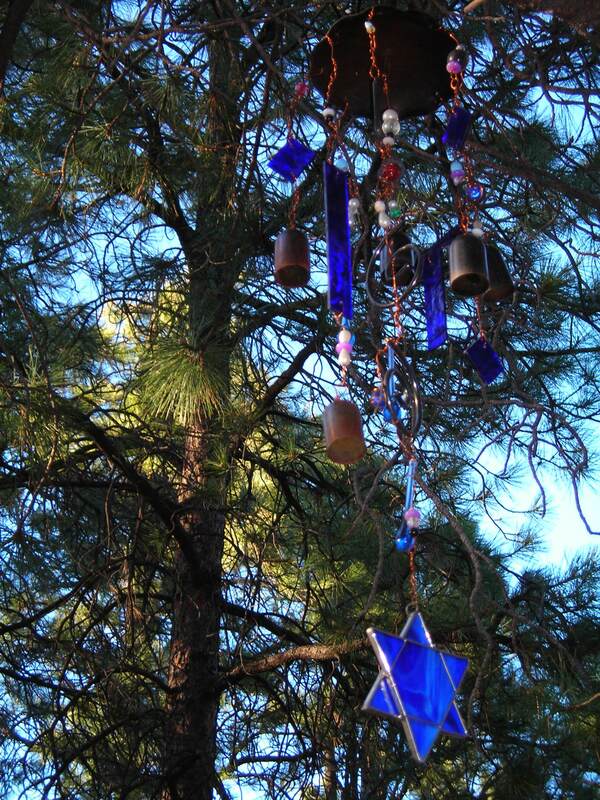 Xia: Could there be a better symbol of change than a windchime? Laurent: I photographed the wind-chime and the Star of David I attached to the bottom of it, for my book Celebrating Divine Presence. That photo is above. This entry was posted in Avatar Meher Baba and tagged Avatar Meher Baba, Christmas, gift, Lilly. Bookmark the permalink. How much do you know about the Hpoi blue star? I was comparing prophecies recently and this final one about the kachina star seems to fit some conclusions I had already made. Kachina being the living spirit in everything and its arrival as a star marks the beginning of the fifth world. I don’t live in southwestern U.S. and have no connection to the Hopi but their style of prophecy intrigues me. I wonder who was the american indian Meher Baba met in Santa Fe on a train trip across america? Maybe a Hopi? I also wonder who the Native American was in Albuquerque. Baba explained that agent’s role, and that he was on the 4th plane. That is all I know. I believe this is in The Wayfarers by W. Donkin.